Here we have a charming scene from 55 years ago. 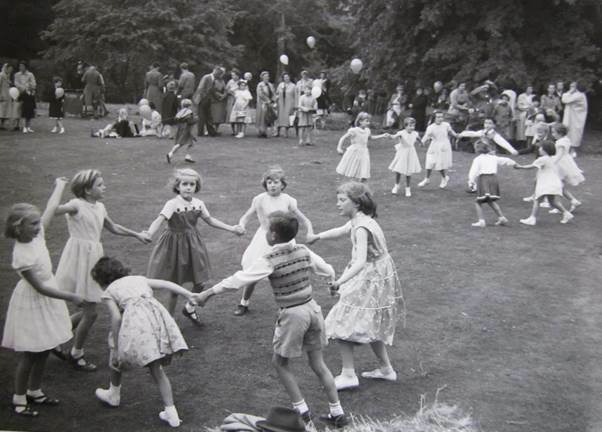 In about 1960 children were entertaining at the fête at Clyffe Hall by doing some country dancing. This photo was given to the museum by Mrs Elisha. Perhaps she had been responsible for organising the children. Of course, we have no names but surely a reader will recognise some of those youngsters. Let’s zoom in on them. From left to right: Patsy George, not yet identified, Susan Giddings, Brenda Stevens, Mary Bishop, not yet identified, Christine Ashley bending down. 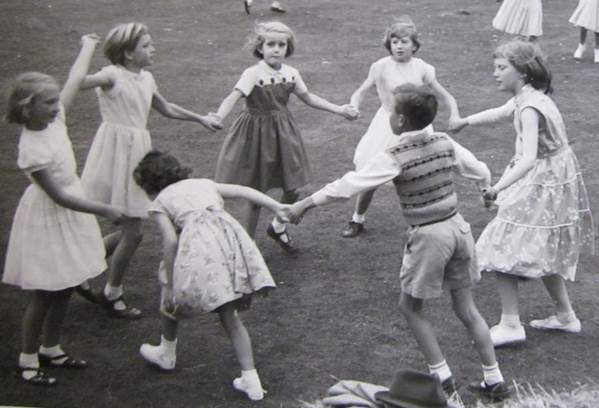 We can be reminded that back in 1960 children were still able to be children. We can note that they are not wearing clothes like those the adults have on. Mind you, from the look of the adults it was a chilly day. Maybe those children would feel in need of wearing something warmer when the dancing stopped. Do get in touch if you can name these young folks. These days there is an area of ‘set-aside’ land alongside the road up Lavington Hill. It is probably supposed to be a belt of land reserved for wildlife – and all credit to the farmer for trying. But it is a very popular spot for dog walkers so the chances of, say, lapwings nesting there are singularly remote. Up until the 1960s this area was very different in form for a deep trench ran from the area we still call The Hollow up the hill. An early 1960s colour print photo shows the scene. 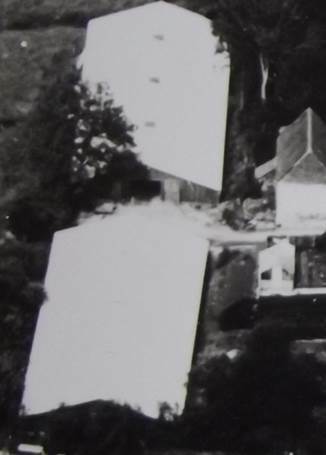 The Hollow in about 1960. We are sorry that the colour rendition is so bad. Clearly, the colour rendition is very poor. It was a green and not a somewhat pink scene. We are looking down the hill towards the village. 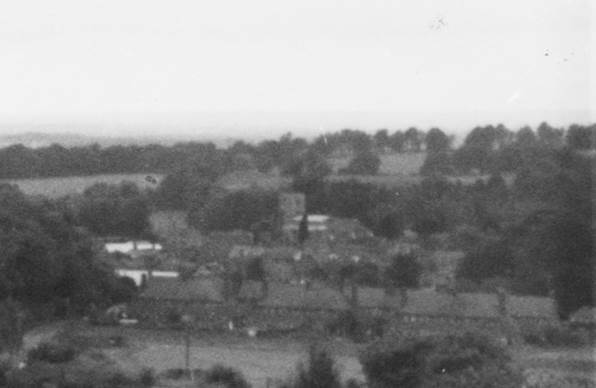 At the bottom of the gulley we see the house in The Hollow and beyond that we can make out the houses on Lavington Hill and St Mary’s church. It looks better converted to grey scale. The Hollow was filled with rubbish, levelled and then cultivated by Mr Snook who farmed the land back in the 1960s. 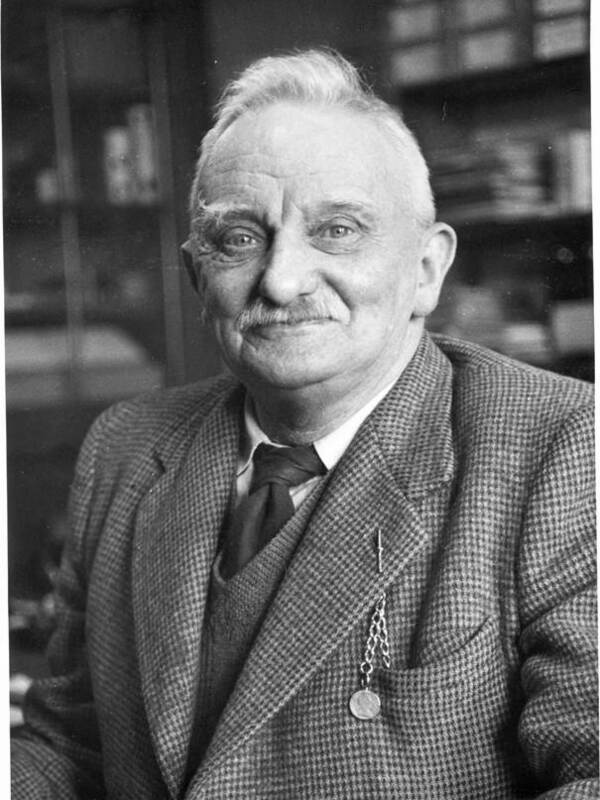 Today we have a photo of James Frank Welch in later life. It was taken around 1960. James was certainly known as Jack in younger days. Later on he gained the nickname of ‘Brandy’. He was a long term member of the Parish Council and served as chairman. James, who was born in 1888, died in 1964. It happens that we have quite a lot of information about Jack’s First World War service. This includes brief personal diaries and rather longer letters he sent home. He put together a scrapbook of photos, cards and other items as well and then there are a few official documents. These will appear in a specific blog – www.jackwelchdiaries.wordpress.com on a ‘100 years after the event’ basis. The blog is in place and up and running and will get pages added, here and there, to set the scene. Once we reach the time 100 years after war was declared the entries on this blog will be about the day to day life of a British soldier, what he hopes for and how he fills long and often tedious days. For much of the war Jack was actually based in India. It was towards the end of the war that he ended up in the heat of conflict. Jack was, of course, the father of Peggy Gye who founded our museum and curated it for many years. Oh to have records which were perfect in every detail. 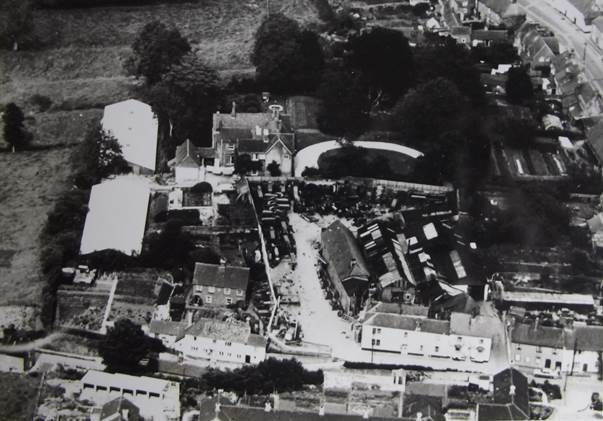 The photo below is described as one of nine photos dating from 1957-60 of the Market Place and surrounding areas during demolition of old buildings to make a council estate. This description hardly fits the bill for this picture. We have an aerial view with some of the new housing in place. There’s a line of chimneys along the bottom edge. A little bit of the Market Place shows at the bottom left corner but essentially we have a view of an area to the north-east of the Market Place. Let’s start with the Ivydene area. 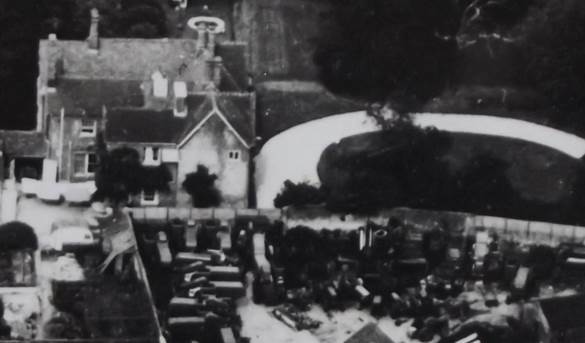 Ivydene had once been the home of Bus proprietor, Fred Sayer and during World War II it became the HQ for a search light battery. To a large degree, though, it is now off local radar. Well, it vanished 50 or more years ago so most people never knew the place. But here it is in this photo. As we can see, there is a terrace of buildings. We think Fred Sayer had the larger building at the right hand end. 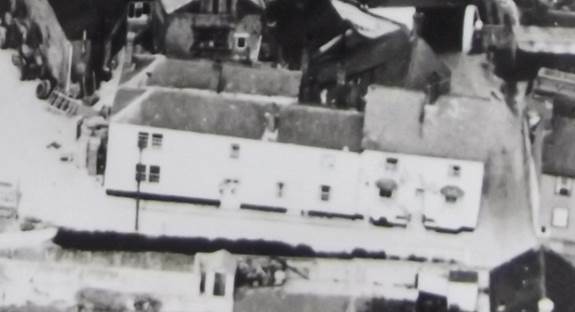 Further left we can see the pair of cottages on The Terrace. Less than a month ago we featured the wedding of Mary Cooper and William Blake. 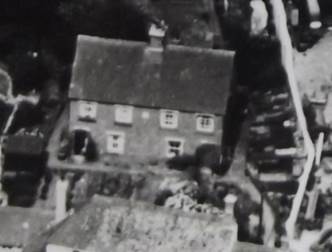 They made their married home in one of the cottages and when their daughter married she and her husband (Percy Wilkins) lived there. 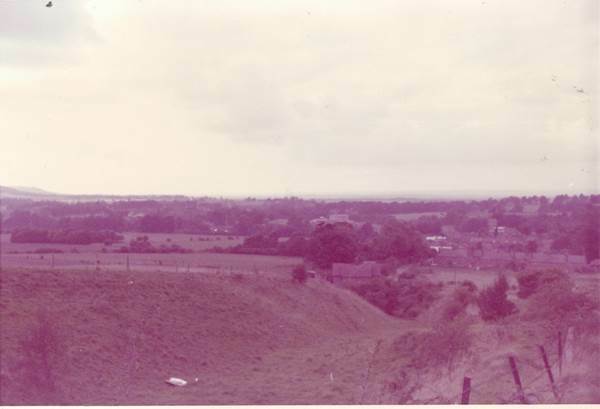 At the time of this photo the agricultural engineers had the yard and sheds behind Ivydene. Behind them was the former vicarage which became, in recent years, a part of the nursing home. We can see the big sweep of the drive in front of the house. 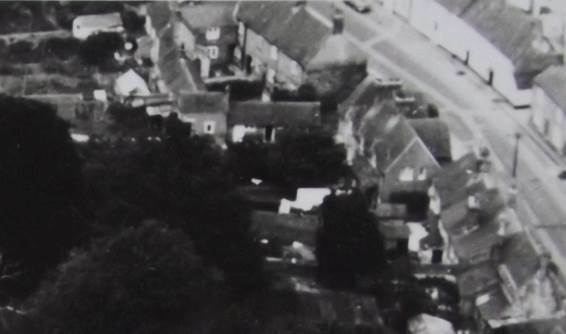 That drive leads out onto High Street and at the top right of the photo we can see some of the houses at the far end of High Street, towards the old Congregational Chapel. It is unusual for a photo not to leave us with more questions. Just behind the old Vicarage there are two large barns. Does anybody know anything about these barns? Does anybody know any of the history of these buildings? It looks as though access was from the Vicarage. We suspect recorder groups are a bit ‘old hat’ these days but there was a time when they were a fundamental part of school music. 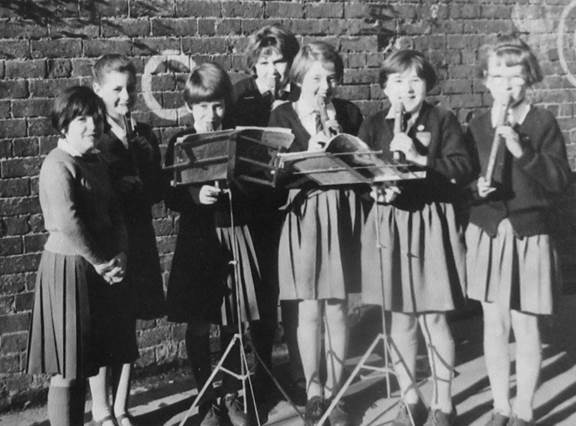 Here we see a group of girls at Market Lavington School who made up a recorder group in about 1960. From left to right we have: Rosalyn Cooper, Sarah Greening, Christine Adams , Jenny Danton, Stella Dark, Barbara Wilkins, Jane Hancock. Perhaps we should have used the past tense for those names. Probably, most of these girls married in the 1970s and so will have changed surnames. You can click here for the curator’s email address. Most of us, these days, use an automatic washing machine. You load it, select the setting and switch on and go and do something else. Later, you come back and remove the washing which already has most of the water out of it. You can easily transfer it to somewhere else to dry. Of course, it wasn’t always like that. Our curator recalls his mother slaving away at the kitchen sink, washing sheets, scrubbing shirt collars etc, from when he was a lad. Our archivist even recalls helping her mother wash clothes using a dolly tub and posser. When washing needed a transfer to the next stage it was often very wet, hot and covered in whatever cleaning agents were in use. Tongs were essential. Then, in the UK, we reached the time of the twin tub washing machine. This had one container for washing and a separate spin dryer. Once again, the washing had to be manually moved from one place to another whilst absolutely sopping wet. Those tongs were needed again. These days such tongs are largely museum pieces. We have some at Market Lavington Museum. This pair of laundry tongs looks almost unused although they are 50 or more years old. They date from the time of the twin tub. The construction is simple. Two ‘blades’ of wood are joined by a spring steel hinge. The wood looks like beech although we don’t claim to be experts. Very similar items can still be purchased so presumably some people still use them and of course, they’d have uses other than for laundry. The home dying of wool or other fabrics comes to mind. These tongs, at Market Lavington Museum, were used by a White Street, Market Lavington family.